There are significant benefits associated with rain water harvesting. I collect rain water from the roof and decks and even from around the foundations. It is then fed to a 7,000 gallon rain water storage tank. A couple of pumps and a pressure tank then turns that into high pressure rain water that is fed to the yard faucets for watering plants. 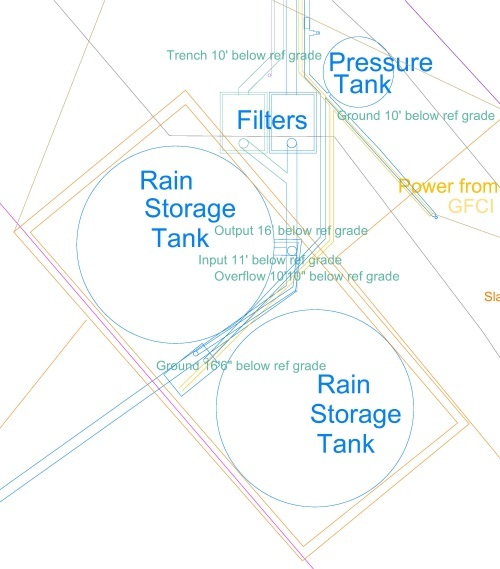 Ideally you should include the storage tank (or tanks) as part of your official drainage plan for your plot. You need to find a place it your yard that is at a suitably low height so that the drainage pipe will be able to slope down to it from the bottom of the footing trenches.